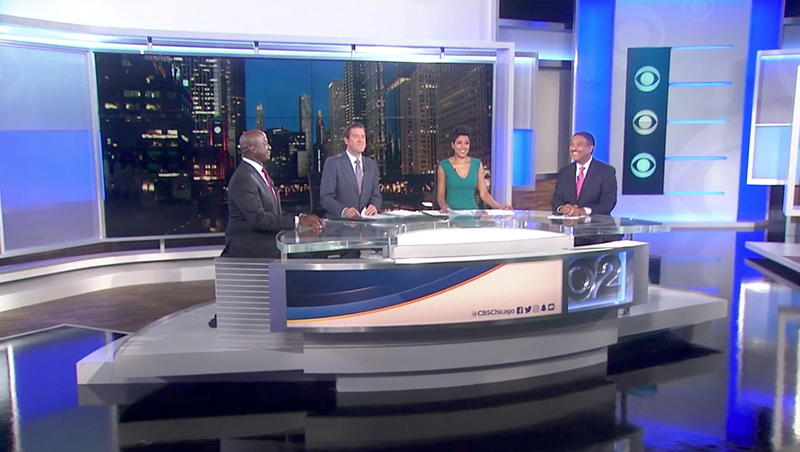 WBBM, the CBS O&O in Chicago, debuted its new home Thursday, Sept. 14 at 10 p.m., moving into a traditional studio setup and away from its former streetside home. 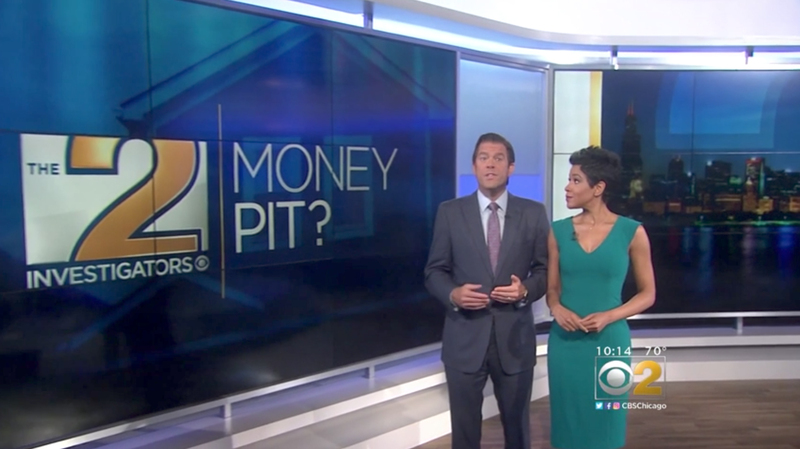 The new set, from Broadcast Design International, is strategically designed to bring consistency to CBS O&O stations in major markets across the country, including Los Angeles’ KCBS, WFOR in Miami, and KOVR in Sacramento, and WCBS in New York, the latter which also debuted Thursday. For WBBM, the move into an enclosed studio space marks the end of using its streetside studio, which was part of the downtown mixed-use development known as Block Thirty Seven. The station still maintains its newsroom, sales and administration offices in the building, which it refers to on-air as the “CBS Broadcast Center,” which has a street address of 22 West Washington Street. The new set features two large video walls using the 55″ SNG line from Primeview that are used as anchor backgrounds and OTS elements from the half circle anchor desk as well as standups that incorporate one or both of the arrays with a camera move. One unique feature added to WBBM’s version of this set is a wall camera right with a narrow stack over vertically mounted video panels and horizontal internally lit lines. The space also includes a wide variety of accent and integrated lighting in addition to the studio lighting design by CBS’s Daniel McElroy. 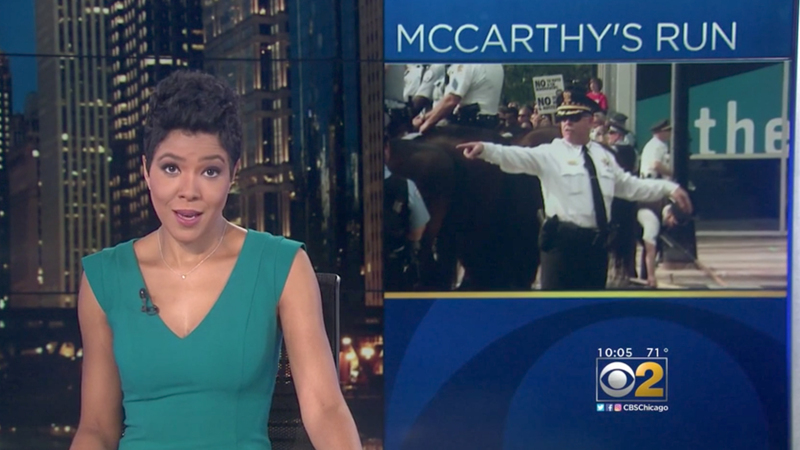 In addition to the new set, the station also switched to using the slogan “Expect more,” placing less emphasis on the “Original reporting” tagline that it borrowed from parent network CBS. With WBBM’s move away from its streetside studio, ABC O&O WLS now remains the only station in the market that maintains a full streetside presence. NBC O&O WMAQ shuttered its streetside studio in 2013. Fox O&O WFLD still maintains a small studio space on an upper level of its Michigan Avenue headquarters that provides views of the street. The set WBBM previously used, which debuted in conjunction with the station’s switch to HD back in 2008, features a printed control room dura with a single real monitor and two large built-in video panels for OTS elements flanking either side. An addition venue features a row of three wall-mounted video panels. The station would eventually move its anchor desk to use this span as its primary background and swapped out the faux control room background for a stylized cityscape, only occasionally using the video panels. The space was also designed with standup and weather locations overlooking the outside street corner, but those positioned were used less and less over the years.